Review of the opening for Janaklees for Visual Arts, a film collective-turned-art-space that aims to help filmmakers from thought-to-product, thereby supporting film and contemporary arts in the Mediterranean city – Published in Ahram Online. Janaklees for Visual Arts hosted several film screenings, installations and live music and video art – all with an experimental and multi-disciplinary theme – over the weekend on 24 and 25 May.Janaklees, a space for overall cinema and visual arts, aims to support the filmmaking process; from turning an idea into a film, giving impetus to a “cinematic wave” in the seaside city. 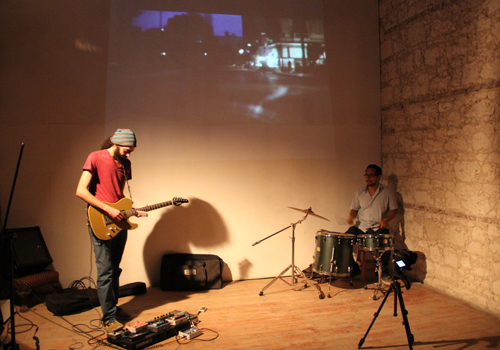 Started by a collective of filmmakers in late 2010, Janaklees occupies the space which once belonged to ACAF (Alexandria Contemporary Arts Forum), one of the few contemporary arts centres in the city before it closed in 2012, which left an evident vacuum on the scene. The walls of the old building in Azarita, just minutes away from downtown’s hustle and bustle, are left without coating to show off the limestone’s simplicity and beauty. Upon entering the relatively large five-room space, it is a relief that Janaklees managed to take it over and it wasn’t renovated by a company into a humdrum office space. In one room several short films were screened looping throughout the night. Bint El-Baqal by Emad Mabrouk; Zakaria by Emad Maher; an animation film by Amr Okasha and Nos Shaabeya by Islam Kamal. Also, filmmaker Ahmed Magdi showed the audience raw footage with a sailor and elaborated on his experience. 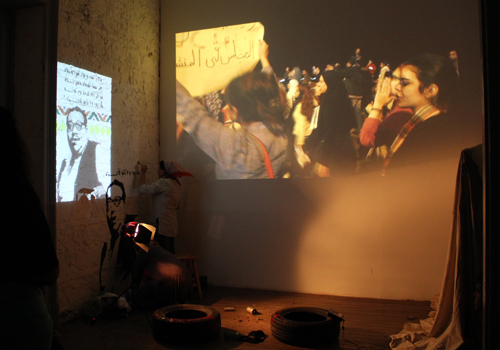 Another room featured an installation on the revolution by Rana Youssef, a political activist and important figure in the Alexandrian graffiti movement. She live paints on the wall, while films from Janaklees’s street activism archive are played, with tyres, Molotov cocktails, pellets and a tent scattered around the RGB lights plastered on the walls. It is worthy to mention that although they have been actively documenting, that was not why Janaklees was founded. Rather, their purpose was for young filmmakers to support each others’ work and Alexandrian cinema at large. During the opening, a small, raw, limestone walled room featured the installation Urbanisation and Demolition focusing on Alexandria. 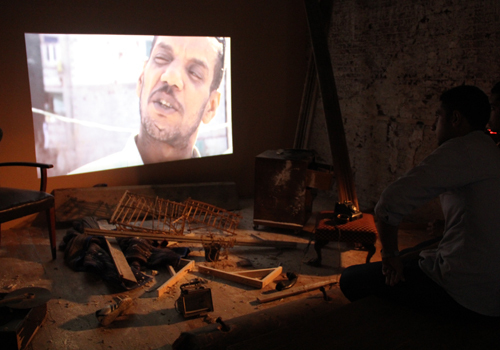 In a time where old historical buildings are being demolished and new concrete blocks are randomly replacing them, this installation attempts to intercede through a video of a village which was forcefully evicted by the Egyptian army. As part of the installation, the room also holds objects that would be found in one of these demolished homes. These installations will all be further developed in the future. Finally, paying tribute to a truly unique project taking place in Alexandria, musician Samir Nabil or “Object Obscure,” played his live guitar loops to video art pieces done by several filmmakers inspired by his series Experience, which included Emad Maher, Abdallah Sharkas, Islam Kamal, Icon and Mamoon Azmy. “In my opinion, Samir is one of the very important musicians in Alexandria,” Sharkas told Ahram Online. “He has been involved in making soundtracks and sound mixing for independent films, as well,” he added. Alexandria, Egypt’s second largest city, has an independent art scene that over the past ten years or so has been picking up due to alternative art education available along with spaces offering opportunities to showcase and develop artists across several disciplines. Perhaps cinema is one of the art forms Alexandrians are excelling at; the city’s location on the Mediterranean and its 19th century architecture that to some extent is still intact in many of its neighbourhoods allow innovation and creative juices to flow if one has a camera and an idea to present in a visually-appealing manner. With the Jesuits Cinema School’s presence, several generations of young filmmakers took over Alexandria’s scene producing high-quality films, on limited-to-zero budgets and a small, but effective community was established. Sharkas recounts the beginnings of the collective, which was founded by four filmmakers: himself, Emad Maher and two filmmakers who were just starting back then, Ahmed Ismail and Mamoon Azmy. Eventually, Maher moved to Cairo and Azmy to Minya, and the collective would from then evolve with different team members in each phase with Sharkas and Ismail remaining throughout. Starting from a small space in Alexandria’s Gianclis neighbourhood, the team took the Abbara (Ferry) grant from the Culture Resource, which offers financial support and culture management training. “This was the organisation’s turning point, where we changed from a collective of artists to a fully-functional established organisation,” Sharkas reflected on their move to the new space in Azarita. “Alexandrian independent cinema relies on making films based on old literature or films that are dreamy and not based in reality. In my opinion, this can be quite dangerous for the future of filmmaking as we need to be more in touch with reality,” Sharkas commented. One of their first workshops will be to turn Alexandrian contemporary literature into screenplays. “The issue in Alexandria now is not in equipment. Perhaps SLR cameras are suitable for cinema, so it is not a problem of cameras but rather of process,” Sharkas said commenting that one of Janaklees’s main goals would be to host workshops for both beginners and professionals regarding the process. The professionals workshops will start with focusing on sound and music for the films, two issues that affect independent cinema in Alexandria as well as Cairo. Emad Maher will host a workshop called “First Time” where people interested in making a film would get into the workshop and come out with a film. However, this will be further into the future. Janaklees also wish to support the culture of producers sponsoring independent films, since here the director is normally burdened with handling all aspects of the film, whereas the director needs to be free to envision and direct the full artistic scope of the production. A producer, asserts Janaklees, should take care of all the financial elements and distribution – not the director. Janaklees wants to bring people together to create a “real cinema industry,” and have clear processes that allow for the scene to flourish and reach more audiences. One of the problems of the independent arts, especially cinema, is that there is no direct financial benefit from the films. Films have to find funding to be made, or be funded by the filmmakers, then the filmmaker looks for culture spaces to screen the films or gets into festivals hoping to gain awards. One of the main projects Janaklees aims to launch in the coming days is “Cinema Daraga Talta” (3rd Rate Cinema) where they wish to transform the space into a miniature version of a cinema hall where people can come and pay a small fee of LE5 (less than a dollar) to watch the film. The money would go to the filmmakers, with Janaklees taking a small percentage. Each week they would host several films from the same director and the films would be screened several times throughout the evening. Janaklees’s conviction in bringing their enthusiasm for the independent arts and their expertise in the field is a much needed addition to Egypt’s Mediterranean capital. Janaklees’s space, along with the highly-anticipated Behna Films space in Mansheya expected to be up and running later this year, could act as triggers for a coming movement that would take the city by a storm, stronger than their infamous Nawwas.